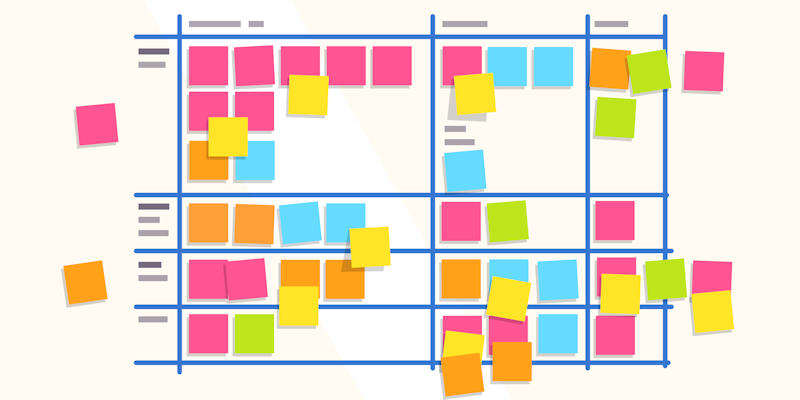 Product prioritization is always top of mind – is the team doing the best thing right now? Am I working on the best thing right now? What’s fascinating is that there are so many different ways to prioritise product roadmaps and features. Sometimes different situations call for different approaches, other times different people prefer different methods. I’ve been wrestling with this topic intellectually constantly over the years to try and come up with “the best way”. Well, I’m not there and I’m not sure I ever will be. But what has helping my thinking is to get a view of all of the product prioritization methods available. I want to share this list of product prioritization methods with you. The purpose of this list is to be comprehensive. We’ll go deep on each method in future posts. Enough talk, here is the list in no particular order. Warning: This post contains excessive use of acronyms. RICE stands for Reach, Effort, Impact and Confidence. You score how many users/customers your feature will reach, how much effort it is, the impact it will have and how confident you are in success. This gives you singe score, your a RICE score that you can use to prioritise. Read more about RICE with Sean McBride from Intercom. Cost of Delay or CoD aims to help you determine what the cost of delaying a product or feature would be or what it would be worth if a task was done a month earlier. Read the wiki page for CoD or get it from the source with the book The Principles of Product Development Flow by Reinertsen. Weighted Shortest Job First or WSJF is strongly associated with the Scaled Agile Framework (SAFe). It is an extension of Cost of Delay. WSJF aims to prioritize jobs based on the economics of product development flow. It looks at the Cost of Delay and the size of the job. Using these factors the idea is you will product the maximum economic benefit. Read more about WSJF over on the Scaled Agile Framework website. Highest Paid Person’s Opinion or HiPPO is probably the most hilarious of the list. Not much more to say, the name speaks for itself. Often used as the single approach to product prioritization. 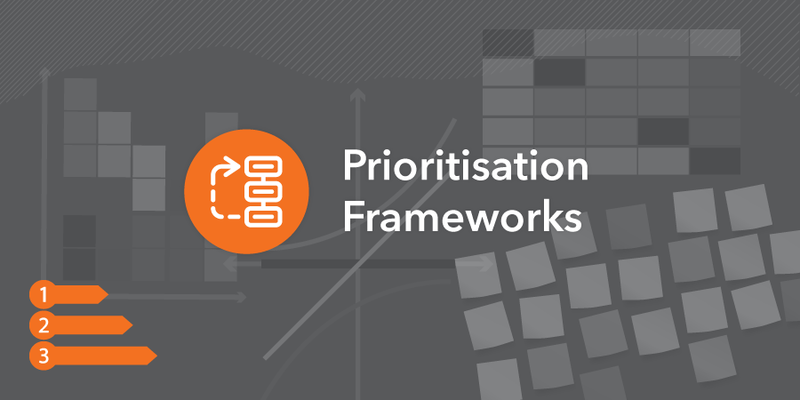 This is the most straight forward and commonly used prioritization framework I see. 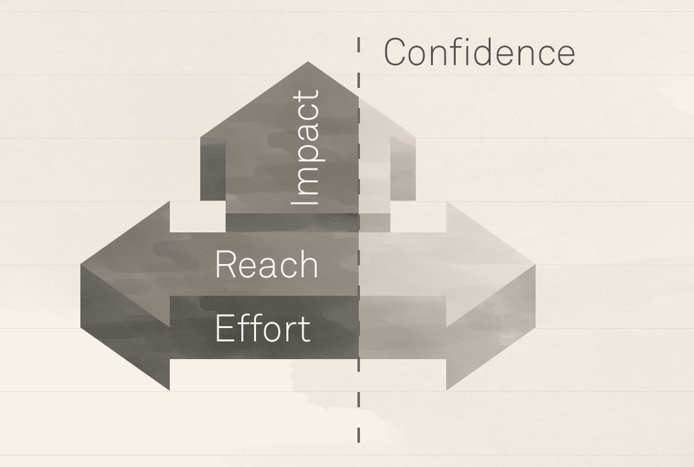 It’s often easy to quickly weigh up the impact of something against the effort. Sometimes this is also known as Complexity v Value. You can read more about how Optimizely applies this. This approach is about coming up with your own weighed scoring system to suit your product to help you prioritise. This weighted score along factors that are important to you then helps you rank you work. Opportunity Scoring arose from outcome-driven-innovation developed by Tony Ulwick’s. It focuses on learning what outcomes customers are trying to accomplish and ranking by outcome. It places more weight on the importance of that rather than the customers’ stated future satisfaction. The formula used here is Importance + (Importance-Satisfaction) = Opportunity. This is then used to highlight and rank the outcomes the customers are trying to accomplish. It is somewhat like doing a gap analysis. Read more about Opportunity Scoring on Wikipedia or go straight for the book. Buy a Feature is where customers and stakeholders are given fake or real money to purchase the features or problems they want solved. Buy a Feature is best played as a game in real-time but can also be used to poll customers individually. The spend of your stakeholders gives you your priority. Must have, Should have, Could have, Won’t have (this time). MoSCoW. This product prioritization method is about putting features into each of the buckets I’ve just listed. It’s relatively straightforward. Read more about MoSCoW prioritization on Wikipedia. Starting with purpose an organisation or team then works through priorities, projects, people and performance to help them prioritise what they are doing. Defining expectations and priorities quantitatively and qualitatively for each area. Then combining this to help set broad priorities. This approach probably applies best to a portfolio of products or initiatives but can equally be applied to features. Read more about it on the Harvard Business Review website. This method of product prioritization is about developing high level user journeys and features. Then taking these groupings and breaking them down into smaller and smaller tasks. You can also sequence journey’s and tasks that will be iteratively worked on over time. There is a good primer on Agile Velocity for getting started with Story Mapping. Product Trees uses the metaphor of a tree to think about and prioritise your product. The trunk represents core features already in your product. Leaves are smaller individual tasks that go into making a feature. The closer to the trunk you place it the more important it is. ProdPad has a great primer on this method of product prioritization. The Balanced Scorecard is a now somewhat old school approach to product prioritization. It attempts to take a wholistic approach to what the organisation or product is trying to achieve. It goes beyond just prioritization and helps with alignment, measurement and monitoring. It’s main features are strategic objectives/maps, high level strategy/mission, measures, targets and the initiatives to get there. By working through the card priorities emerge and evolve. Read more about Balanced Scorecards over at the Balanced Scorecard Institute. QFD is a structured, formal process for prioritising and developing products. The customer’s needs are assessed alongside competitors, development efforts required. There is more to it than I can do justice here, so read more about it if you are interested. A classic financial formula. Look at the future cashflow that will come from an initiative, then discount it back to present day value. Works wonders if you have clarity over what future cashflows will look like. You can then compare the future cashflow against other opportunities you have for future cashflows. Read more about NPV on Wikipedia. A popular post on Quora has given rise to a straight forward framework. No doubt made more popular by the fact that Ian is a Director of Product at Airbnb. The framework is interesting because it prioritises themes not projects or features initially. Then you generate and prioritise ideas within those themes. Read it from Ian himself on Quora. If there are any frameworks I’ve missed then send me an email or hit me up on twitter and I’ll add them.